The first reaction I get when I tell people I’ve done runs over 100 miles is, “Wow. I could never do that.” The truth is, I’m nobody special. Most of us are capable of epic things, but the devil is in the details. 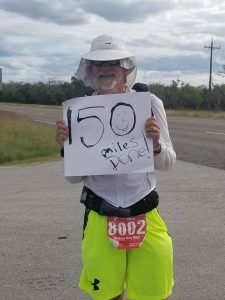 The best way to think about a run like the Capital to Coast solo run, which spans 223 miles from downtown Austin to the USS Lexington memorial in Corpus Christi, is to break it down into pieces. That’s because if you stare at anything epic for too long, the sheer size of it overwhelms you. 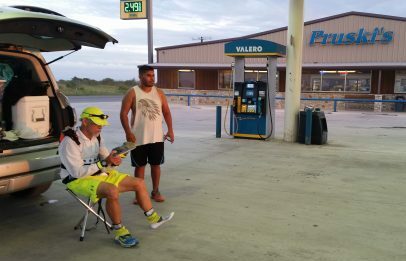 During 3.5 days and 223 miles, I must deal with a host of issues, including nutrition, hydration, sleep, comfort, temperatures (usually heat), hygiene, fatigue, blood sugar management, and the sheer, unrelenting monotony hundreds of miles of country roads at all hours of the day. I break it down further by looking at the particulars involved in addressing those needs. Whatever food I eat must a) provide me with both instant and long-term energy, b) stay down, and c) not be too dry, chewy, or messy to eat while walking, because the more you sit down and stop to eat, the more you’re not going anywhere. For me, this meant eating a lot of full-fat yogurt (carbs, fat, protein, and cold! ), fruit cups, and pudding. Pro tip: “if you chew it, you poo it.” That was another reason yogurt did very well for me, given that there weren’t a lot of places on the C2C route to stop for a long restroom break. The fact that yogurt was liquid also helped hydrate me just a little bit more. Another thing about nutrition: most marathoners, long-distance cyclists, and Ironman competitors train to adjust their food intake to mix fast and slow-acting fuel sources. They tend to be quite focused on the perfect nutritional mix that will help them go faster. For 100-milers and up, you can’t go fast (or at least super-long distances at faster speeds) without injuring yourself. You have to pace yourself, avoid injury, and eat ANYTHING that will stay down. That’s why you seldom see anyone do hundred- and multi-hundred mile races any faster than a 15-17 minute mile. Ultra runs are famous for aid stations that have chicken soup, baked potatoes, sandwiches, and pretty much everything you’d see at a family picnic. There’s a reason for that: running 100- and 200-mile runs requires a LOT of calories. It’s not about efficiently burning body fat, an objective many newbie runners have. You will lose way more weight than you want to — for instance, I lost 7 pounds in 3 days despite eating 4000 calories a day. It’s about avoiding autophagy, a condition where your body starts eating itself to provide energy, and one that can become dangerous as muscle protein breaks down excessively and stresses the body’s immunological, recovery, and waste-disposal mechanisms. What’s even more dangerous is that under those conditions, despite eating twice your nirmal daily calories, you are often on a severely calorie deficient diet for what you’re attempting, AND you won’t want to eat. How to prepare: do a lot of training runs as close as possible to race conditions, including distance, time of day, weather, etc. Bring a little of everything, and write down what you actually ate. Eat whatever tastes good, and if it’ under 45g of carbs, don’t bolus for it. For your major meal stops, be SURE to get a bolus so you can a actually replenish glycogen stores. Managing hydration for an ultra long distance run has some subtleties. One is that at times you won’t be thirsty despite actually being dehydrated. It’s easier to drink more of cold liquids, and try not to ration water unless your crew van is nowhere in sight. I have found that too much potassium causes a feeling like heartburn, so I mix Gatorade endurance with Crystal Light lemonade. It’ refreshing, salty, and it comes in flavors, which helps with the monotony of running. How to prepare: Bring whatever you will drink a lot of. Because dehydration will mess up your thinking and things go downhill from there. Unless you pack a tent, cot, sleeping bag, or similar, you’re looking at sleeping on the ground or in hotels. Personally, I like hotels better. But it takes time to check in and check out, and if you have a crew, you have to plan on who gets to use the shower first. Also, not every town even HAS a hotel — even a crappy flea-infested motel. So if you’re intent on getting a hot shower and a good night’s rest, you’re stuck fitting your running schedule to how many miles you can make it each day and still manage to end up in a town with a hotel. Then, in addition to sleeping, you have to check in and out of the hotel. Bottom line: you need to plan for not just the time you sleep, but the time it takes to GET to sleep. Otherwise, you’ll waste 90 minutes a day of your sleep time just trying to get into bed. Eventually that will add up, and you’ll be forced to make unpleasant compromises on your rest time. How to prepare: Get up at 3 AM and go run 20-40 miles. When you get home, sleep on the floor, and set your alarm for 3 hours from that time. Then get up and run another 20 miles or so. You won’t be able to train to run without sleep, but you can train to recognize what it feels like, and teach yourself to appreciate just how precious and delicious a good night’s sleep actually is when you don’t have it. After 60 or 70 miles, EVERYTHING hurts. You need to plan on how you’re going to keep going despite that fact. You can’t just pop NSAIDs because they wreak havoc on your gut after a while, and they aggravates a tendency that long-distance runners have toward increased gut permeability, causing intestinal distress. Staying comfortable may mean switching clothes during the day, sometimes multiple times depending on how much you sweat, weather changes, and how much you can tolerate diaper rash (salt… sweat… you can figure out the details!). It makes sense to scope out your run’s route in advance to look for potential opportunities to sit down. This could include state parks, bridges, guard rails, etc., but literally could be anything not crawling with insects or vermin. You can try pushing on through running, but you will eventually have to run-walk when your feet get sore. It’s smart to start that practice BEFORE they get sore. You WILL have to sit down. If there are no good places to sit, you need to pack a camp stool or shade chair or something else that will let you get out of the sun and off your feet. How to prepare: Sit up STRAIGHT. RUN standing up straight. The longer you stay bent forward, the more your back and glutes will hurt, and the more your feet will hurt trying to compensate. Some of your training should include speed walking. Bring extra shoes of both the same size and one half size up from what you train in. You may want to stop every so many miles and massage your feet. During training with your crew, develop a routine for tending to your comfort during brief breaks, or discomfort will slow you down. Speaking of sun, an ordinary running hat just won’t cut being out in the sun for the entire day from sunup to sunset. Get a broad-brimmed hat with a “Kalahari” flap (such as the one in the picture). Another good item is a desert running shirt (see picture on right). These are white long-sleeve super-thin double-layer nylon shirts that cinch at the wrists and lie open at the chest, with vents under the arms. The design forces any heat that makes it through the first layer of the shirt to be trapped outside the 2nd layer, and that heat rises out through the chest, cooling you down even when temperatures are above body temperature. The sun on the side of your face: I usually don’t feel this as heat, but as an increasing sense that I have to sit down. I believe it’s because, much as if I were in a sauna, heat affects the head differently than other parts of the body. If the brain’s not happy, ain’t nobody happy. The sun on your back: Mostly this is just a nuisance, but with just a plain wicking running shirt with no significant SPF protection, you can sunburn even with a shirt on and the extra heat in an area that’s one of the body’s largest surface areas used for RELEASING heat can be a problem. I usually find this cause me to slow down my pace, and had I picked a better shirt, it wouldn’t be a problem. I find that if this is the primary challenge, something like DeSoto‘s SkinCooler products works well, especially the tri top and running shirts. The sun on your arms: It’s not heat but “insolation” (solar radiation) cooking your arms that can not only sunburn you but contribute to overheating under the skin even when ambient temperatures are in the 70s and 80s F. As above, SkinCooler arm coolers work well for me, and have side benefits: First, when it’s cold, they act as arm warmers. Second, when it’s dry and hot, they have a high SPF and keep the sun off your arms. Lastly, when they’re wet with sweat, the xylitol-impregnated fabric is more evaporatively efficient than a normal running shirt, and feels quite cool, like peppermint! The sun on your neck: The best thing for this is a wide-brimmed desert running cap with a Kalahari flap. Solumbra makes a good one, as does RaidLight. You’ll want to think in advance about how much protection you want for the side of your face vs the front. The Solumbra hat works well for low, slanting sunlight in front of you (running east) and high-noon sun but doesn’t offer much side-of-the-face protection; the RaidLight is not as comfortable but has better side-of-the face protection. The ambient heat: For temps 95 degrees and above, a cool head rag (such as a souvenir transition towel from a triathlon) AND an ice bandana (such as these made by ZombieRunner) are an absolute necessity. The nice thing about the ZombieRunner bandanas is that they have a pocket in the neckerchief for ice. You can make the call yourself whether to let it melt and run down your chest or put the ice in baggies and stay dry. As far as cold goes, it’s a bit easier to just add layers to stay warm. You want to avoid getting damp, which is hard to do when you’re sweating, so it’s a matter of layering wicking fabrics so that when you’re cold, the moisture wicks away from your body. I’ve found that after a while, stress can elevate body temperature and cause flu-like symptoms, and staying warm in such situations can be a challenge. I’ve found that a lightweight neoprene running vest does wonders, and the good ones weigh just a few ounces. How to prepare: look into the gear I mentioned above. Run in the summer in the middle of the day. And sauna train as much as you can. If you’re a guy, and no cars are coming, you can relieve yourself on the side of the road. Now, I said you CAN. That doesn’t mean it’s legal, or that somebody won’t report you to the police for doing so. But regardless, the mechanics of taking a #1 aren’t that difficult. If you’re a girl, Go-Girl makes a product that lets you do a #1 standing up. Either way, it makes sense to invest in a privacy tent. 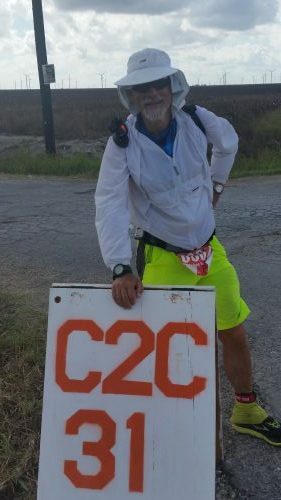 Regarding #2s: At the Capital to Coast solo run, I was very, very fortunate that my stomach wasn’t acting up at any point. Towns with gas stations / restrooms were on average about 12 miles apart. The longest stretch without one was about 20 miles, and on that segment it was a challenge to make it to Pruski’s fuel stop by the 8 PM closing time. I really had to go! And I made it there by 7:30. As you can see, I was relieved, in more ways than one. HOWEVER, if you’re not so lucky, fear not. There is a product called Biffy Bags, and that plus a folding toilet seat can do wonders. Don’t forget to get the folding toilet seat or your will be doing squats under stressful conditions, on tired legs. And Handi-wipes. Never run out of Handi-wipes. How to prepare: Check out your route carefully so you know EVERY opportunity to go #1, #2, wash your hands, or take a Handi-wipe bath. Follow the military rule of never passing up a chance to take a shower or go to the restroom. All runners get tired. But there’s something different about fatigue. It takes you to a gray place, where the sun always seems to be setting and the road stretches out into infinity. You’re cold, you’re not mentally sharp, and little noises all sound like snakes and coyotes. Bugs get in your mouth. You’re hungry 30 minutes after you just ate. And — especially at night — you wonder Where the Hell Is The Chase Van?!! There’s only so much you can do to plan for fatigue. You can anticipate it, or you can react to it. But it will come. The best you can do is to stay loose, rested, moderate your pace, and settle in for the long haul. Alter between running and speed walking. Sing to yourself. I recommend against simply rolling down the jams because after a while whatever music you’re listening to will sound too loud, too harsh, too… much. Try not to be hypnotized by your headlamp when you’re running at night. Set up a safety protocol, so your crew knows when you’re not doing well, even if you deny it. Then follow it. For C2C, our team set up “safety questions.” If I couldn’t answer correctly what year I was born in, diagnosed with Type 1, or what was left when you subtracted 11 from 29, that was a signal to stop, sit down, and rest for a few minutes. You should know in advance what your preconditions are for quitting vs taking a rest, and they should be based on safety. Then make sure everyone in the crew knows they can ALL ALONE call a stop to your participation if they feel you’re risking your health. Conversely, it is EVERYONE’s responsibility to agree that you’re “good to go” for your long run. Infusers sweat off. Sensors go wonky. CGMs refuse to calibrate, and all at the worst possible moment. Sugars run high for no reason. Or because of stress, or overfueling, or dehydration. There are many, many reasons blood sugars act up during a long run — at my last count, I could name 20 different factors (I’ll blog about that soon!). You can pay more attention to hydration. You can add more fat and protein to your nutrition. You can add more carbs. You can add more calories. You can try changing infusers, swapping cartridges in your pump, try to sleep more, and a host of other things… and still be no better off. I talked a bit more about this in my post on stress, so I’ll just deal with the preparation piece here. How to prepare: In the end, all you can do is test test test, and practice everything so you’ll have seen all the factors likely to affect your race in conditions as close as possible to your race. Try to get an idea of what you’re up against, and bring the things you’ll need to fix the problems you’ll encounter most often. Do a dry run of your event if you can, duplicating at the very least weather conditions and time of day. Test often, and most often when an unverifiable number could cause cascading problems with lows or highs. Bring extras if everything. Wear two CGM sensors that won’ fail at the same time. And pack a lot of Skin-Tac and alcohol swabs for reaffixing loose stuff in a dry and sanitary way. If you’re new to long distance running, you probably still retain a bit of the romantic notion that out there somewhere, the endless road beckons for you to go out and commune with nature, the sun at your back as you tick off the miles and watch the dotted line recede behind you as you run into the sunset. Here’s the truth: the road IS endless, there’s WAY too much nature, the sun on your back gets to be annoying, the dotted line hypnotizes you, and after a while you just want the sun out of your *^$#ing eyes. What’s worse, when it gets quiet is when it really grinds on you. No more braying donkey smelling up the entire county. No buzzards circling over a dead deer. No coyotes howling in the distance. Just… more… freaking… miles. You’d think that after taping your feet and running for 4 days on 7.5 hours of sleep, monotony would be the least of your worries. But it can be unrelenting, and without distractions, a long run can start to feel like Chinese water torture. You can, of course, ask your crew to crank up some Funkadelic, but as mentioned above, after a few minutes that can get annoying. You can switch to some other type of music, tell jokes, or make light conversation. Every little bit helps, but just a little. The combination of fatigue and monotony can beat you down and soften you mentally. You become emotionally volatile. You think you won’t, but you will. At the Capital to Coast solo run, around mile 180 I started to see relay runners pass me. One or two shouts of encouragement was all it took to snap me out of my funk. How to prepare: Recognize the emotional volatility for what it is: a hormonal response to stress. Make sure you and your crew understand that harsh words said during your race were the product of the race, not of any just-under-the-surface evillity or resentment. Make sure that everyone on the crew knows that ANYONE can be susceptible to fatigue and monotony, and try to address it whenever possible. Sometimes, though, it’s just impossible to avoid. Try to remember, you’re out there to do something epic, and you’re all in this together.